Preparing all students to be successful in their chosen career pathway after graduatin from high school is a priority in the State of Ohio. All school districts are required to adopt a Career Advising Policy that helps bring relevance to the core academic curriculum by including career exploration and planning for post secondary success. Students have many options as they complete their hight school education and prepare for their chosen career. These options included opportunities to earn college credit while attending high school and/or participating in an intensive career technical education program in addition to taking traditional high school courses. Students who are at risk of not graduating receive targeted supports through Student Success Plans that outline specific strategies to insure student success. Student Success Plans are tailored to meet each student's academic needs and provide optimal opportunities after high school. Additionaly, Individual Education Programs (IEPs) for students age 14 should include postsecondary goals in the areas of education and training, competitive integrated employment, and independent living. This graphic represents how these career connections can be addressed at each level of a MTSS. A Multi Tiered System of Supports (MTSS) helps schools address the needs of each student. In Teir 1, all students benefit from the school's Career Advising Policy and the plans that are implemented to connect career preparation to academic content. Tier 2 provides supports to target the needs of students who are identified as at risk of not graduating from high school through the Student Success Plans. 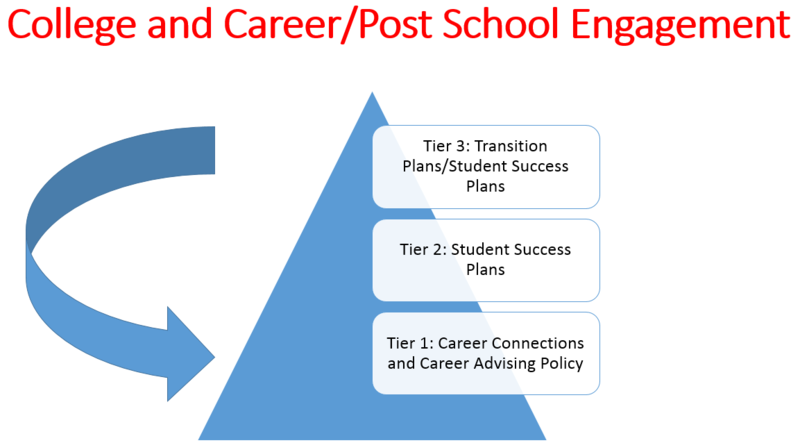 Tier 3 supports identify student career and college or post secondary training goals and designs specific activities to help students reach those goals through the transition plans in addition to supports provided in tier 2.